This is a pretty basic script that download and install Skype for Business Debugging Tools. Este es un script basico pero muy util, para descargar e instalar el Debuggin Tools de Skype for Business. Script sencillo pero util para descargar el Skype for Business Debuggin Tools. Microsoft announced at WPC Skype Operations Framework. The Skype Operations Framework (SOF) is a comprehensive guide and toolset for implementing and managing a reliable, cost-effective communications service based on Skype for Business. It covers the entire customer lifecycle, including planning, deployment, adoption, and operations. 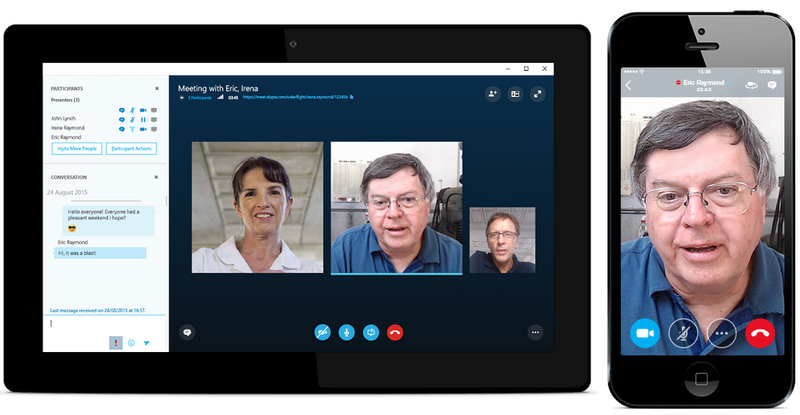 It is a multi-faceted approach to the successful deployment of Skype for Business, incorporating four key elements that have customer success firmly at the center. The SOF framework provides a standardized approach to successfully plan, deliver and operate Skype for Business by incorporating practical guidance, tools, assets and recommended practices. The SOF readiness via Skype Academy provides targeted training to educate customers and partners on Skype for Business products, services and best practices, while providing theoretical training along with internship and guided deployment opportunities to apply learnings to real-world customer engagements. SOF provides the foundation for customers and partners to accelerate their Skype for Business Online journey. We are providing the delivery methodology in SOF to guide customers and partners on when and how to use the tools and assets. This is a major benefit for many who in the past have had to work out how to navigate the deployment journey on their own, investing significant time and effort to develop their own delivery methodology from the ground up. Customers and Partners can now build their own delivery capabilities using the SOF delivery methodology as the foundation. In addition, FastTrack is the customer success service design to help customer move to Office 365, smoothly and with confidence. It covers planning, deployment and adoption aspects of the customer lifecycle. FastTrack best practices, tools, and resources associated with Skype for Business are based on SOF. SOF extends FastTrack with guidance for ongoing operational management, and provides additional Skype-specific details for planning and deployment. All Office 365 customers should utilize FastTrack for planning, deployment, and adoption, and should follow SOF throughout the lifecycle of Skype for Business deployments. In addition, customers should consider using partner managed service offerings built on SOF for elements not covered by FastTrack, including ongoing operations, and, when needed, other workload specific activities. You can check all the information about SOF at the official page. 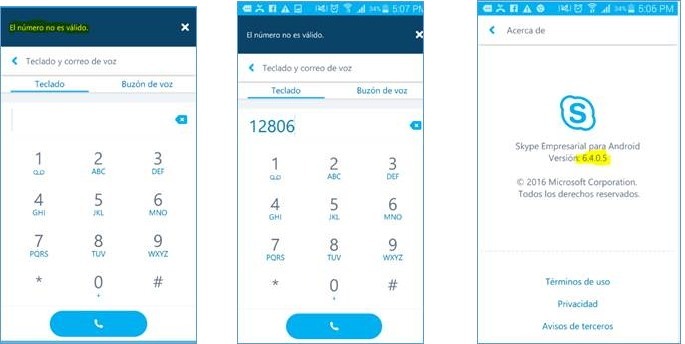 El día de ayer Microsoft lanzo la nueva version del cliente de SfB para Android. Abrir directamente tu calendario de Outlook desde el tab de Skype for Business Meetings. Microsoft now presents the Preview of Skype (Consumer) Free Meetings Tool , a solution for small companies. You can also schedule the meeting with outlook to later time. With the June SfB Cumulative Update (https://www.microsoft.com/en-us/download/details.aspx?id=47690) Microsoft add VbSS (Video Based Screen Sharing) support to Skype for Business Server 2015. The difference between VbSS and traditional screen-sharing has to do with the underlying protocols used, and what they excel at. Screen-sharing uses the remote desktop protocol (RDP), which is great at creating thousands of 1-to-1 sessions between people’s computers. Newer technology, VbSS, will make use of User Datagram Protocol (UDP). All this sounds great, but I bring to you a video where you can compare the difference between RDP and VbSS. We have an issue with Android SfB Mobile Client version 6.4.0.5.
iOS and Windows Phone Client works fine. So, I recommend DONT UPDATE ANDROID CLIENT! Intentamos con una versión previa 6.0.0.5 y funciona correctamente. 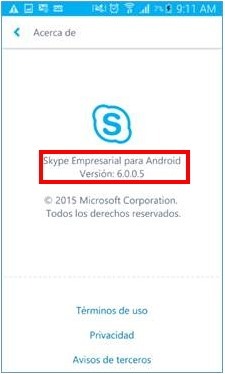 Los clientes de iOS y Windows Phone funcionan a la perfección. Además en Technet encontré que mas gente presenta el mismo inconveniente, con números de 7 dígitos o menos. Así que les recomiendo NO ACTUALICEN EL CLIENTE ANDROID! 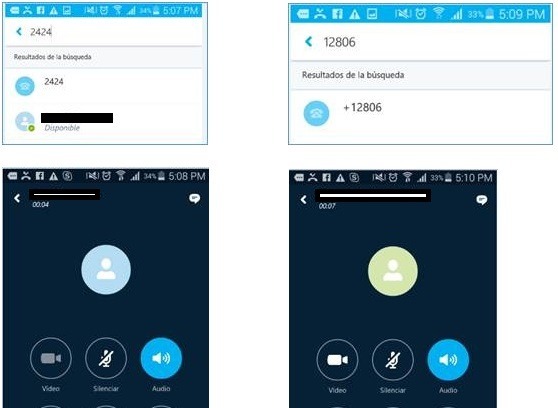 Si ya lo hicieron, hagan un downgrade con un .apk que tengan de respaldo. Actualizare este post cuando tengamos algún fix o solución por parte de Microsoft.